Top Ten Tuesday is a weekly meme/feature hosted by The Broke and the Bookish. This week’s topic is: Thanksgiving freebie. 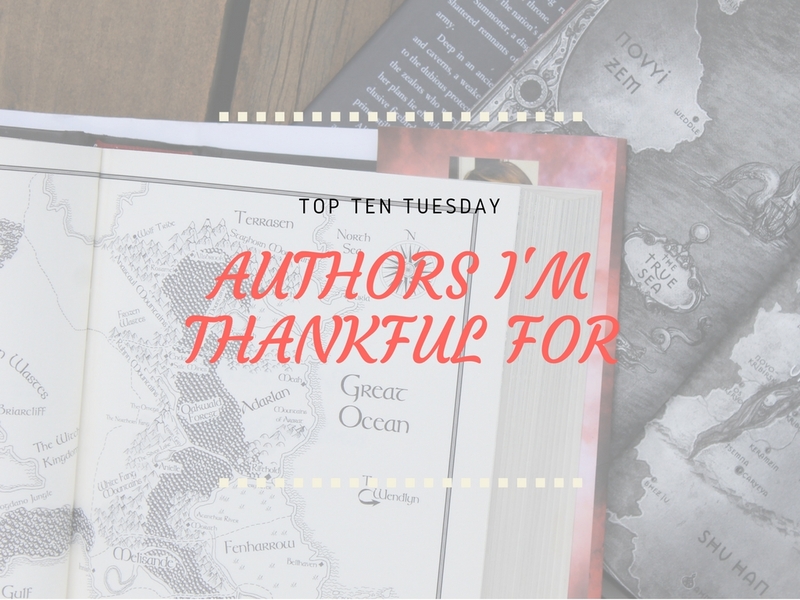 With Thanksgiving right around the corner, I thought that for this Top Ten Tuesday I would share the ten authors I’m grateful for! There are so many wonderful authors, but for this list I’ve narrowed it down to the ones that got me into reading and where I am now. If I hadn’t picked up The Son of Neptune three years ago at the airport, I would not be here today, to put it simply. The Percy Jackson books introduced me to the YA world when I had been reading middle grade books. At that point, middle grade was past my reading level, so I will always be grateful that I read Rick Riordan’s marvelous series and discovered YA books. When I was in third grade, I was obsessed with the Emily Windsnap and Philippa Fisher books. They were about mermaids and fairies, so basically every little girl’s dream. I remember finishing one book and begging my dad to take me to the bookstore when I was on vacation. I don’t ever talk about this series on here, but it has been one of my favorites since third grade. The first book I read was Dear Pen Pal, not realizing it was halfway through the series, so then I read the other ones. I loved all the characters, and Heather vogel Frederick made them relatable and interesting. It’s a middle grade series, but will still always hold a special place in my heart. For my last MG author, we have Wendy Mass, who wrote the Willow Falls series starting with 11 Birthdays and one of my favorites when I was in fourth grade, Every Soul a Star. I honestly don’t remember much about these books at all, but I do remember how much I loved them and how impossible they were to put down. The Hunger Games was one of the first YA books I’ve ever read. I think I read it back in fourth grade (maybe fifth?) and I loved it. It was my favorite book at the time, but now It’s kind of moved down my list, but I will still always love these books. My mom had bought them back when they were new and my sister was a baby, so I had borrowed them from her and read them in about a week. As crazy as this may seem, the first YA book I ever read was Cinder by Marissa Meyer in third grade. Yep, third grade! I saw it at the Scholastic book fair my school was holding. The cover instantly caught my eye, it looked like Cinderella, but not quite? So then I bought it and read it and loved it. I had been anticipating Scarlet so much, but didn’t want to read it because I was worried it was too mature for me. Then I kind of forgot about the books and later picked them back up in sixth grade. I remember reading City of Bones in sixth grade when my family as driving to Montana for Christmas and then begging my parents to buy me the next books even though it was nearly Christmas. Now I realize, these books aren’t the best (The Mortal Instruments), but then I read The Infernal Devices and fell even more in love with Cassandra Clare and the shadowhunter world. I bought Throne of Glass at the end of sixth grade then read it that summer along with Crown of Midnight and Heir of Fire. Then, a few months later Queen of Shadows came out and I fell even more in love with Sarah J. Maas and her writing. Now, at this point I had already made a bookstagram account, but I feel like reading these books kind of introduced me to so much more in the YA community. This was also the first book signing I ever went to, Queen of Shadows! I didn’t pick up a Leigh Bardugo book until last year when Six of Crows came out, but I immediately fell in love with it. Then a few months later, I read the Grisha trilogy and realized just how much I loved Leigh Bardugo and the world she created. In case you didn’t already know, she’s one of my all time favorite authors ever. What authors are you grateful for? And which authors helped you get into reading and/or introduced you to the YA community? Make sure to like your TTT post below as well! Ohh I’m so thankful for Suzanne Collins too!! Her books got me started on YA and then blogging, so basically I have her to blame for EVERYTHING. And no regrets!! Hehe, and I love Cassandra Clare so much. <3 The Mortal Instruments really got me addicted to paranormal and I still love them mightily, and I get even more excited about how much her writing has matured too over all the series. She's so inspiring and she's written so much and ajfdskla she's definitely one of my writing heroes! AND YES TO LEIGH BARDUGO WHO STOLE MY HEART WITH SIX OF CROWS. <3 So basically this is such an epic list and I love it! I definitely have a lot to thank for especially Suzanne Collins like many, that’s how I got introduced to the YA book community and Cassandra Clare for showing how awesome fantasy is. Great post Adalyn!! Thank you! Cassandra Clare was one of the first YA fantasy authors I had read, so I definitely thank her for introducing me to the amazingness that is YA fantasy. For sure! It didn’t necessarily lead me to YA books, but it led me to Rick Riordan, which then led me to YA, so it kind of did? The Hunger games will always hold a special place in my heart though.